The renovated Residence Inn Downtown San Antonio hotel is an ideal choice next to the Alamo and steps from the River Walk. Our hotel in downtown San Antonio near the Alamo provides what you need to maintain your normal pace and thrive during extended stays in San Antonio, Texas. Enjoy a new, modern lobby designed with a variety of comfortable spaces, making it easy to hold impromptu meetings, connect with our free Wi-Fi, and refuel with refreshments from The Market. The spacious guest suites at this San Antonio extended stay hotel are also enhanced to better meet your needs. A new sectional sofa, an ergonomic desk, updated bathrooms and contemporary color schemes complement each downtown hotel room's separate spaces for eating, sleeping and working, along with a fully equipped kitchen. Enjoy a free breakfast in the morning before relaxing at our evening social hour with complimentary light fare and drinks. 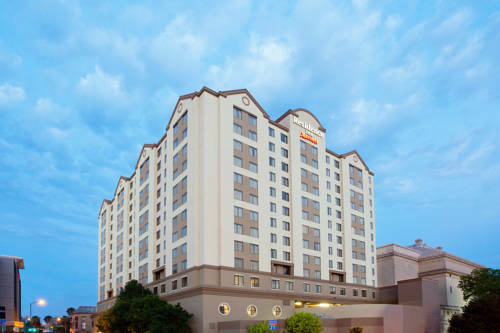 Enjoy comfort that feels like home at our Residence Inn San Antonio Alamo hotel. - Toyota Manufacturing Texas, Inc.